What is it? 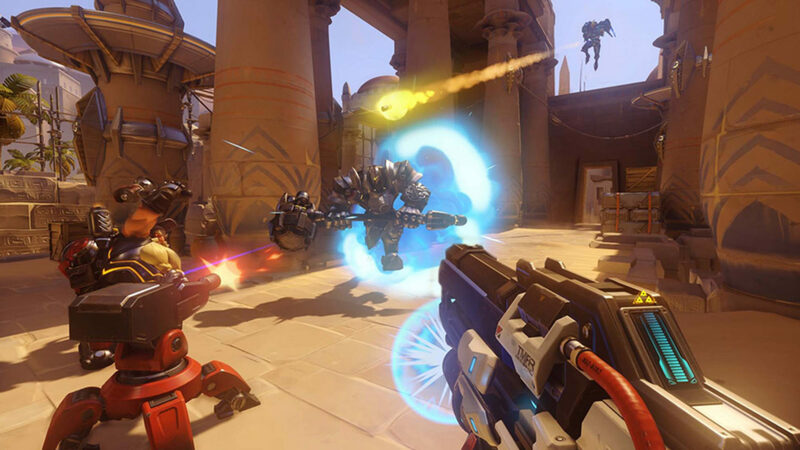 Overwatch is a competitive round-by-round team based multiplayer shooter that relies less on rooty-tooty-shooty skills and more on working as a team, using all the classes available to you and playing smart. Multiplayer shooters are a dime a dozen these days, especially if you lump in how many campaign focused games are still tossing in multiplayer modes for no good reason as well. The guys from Blizzard (Diablo, Heroes of the Storm, Starcraft, Warcraft, they really need no introduction…) have entered the online shooter space with a game that is being compared mostly to good ol’ Team Fortress 2, which is a fair comparison to a degree, so don’t get it mixed up with the fast paced online shooters like Unreal, Doom and COD. The game contains 21 characters split over the 4 classes of Attack, Defense, Tank and Support. Every single character is completely unique, with no two playing anything alike and have all been moulded and designed around fun and familiar character concepts such as a gun-totin cowboy, a cyborg ninja or a Mad-Max inspired bandit each with their own weapons and special abilities and in many cases they have a sort of rock/paper/scissors relationship with each other. This official gameplay trailer does an excellent job of portraying the different roles of characters and how games could go down. It is for that reason that it’s truly a marvel that every single character is not only deeply satisfying to play with but also that the games amazing design allows you to learn and get comfortable with characters in an incredibly short time, as this isn’t the sort of game where you pick a main and then stick to them. The joy is rather found in playing the right people in the right situations and just exploring the possibilities of different team setups and having fun working together as all modes are also objective based rather than settled with kills. It’s really just important to note that my experience with Overwatch has been one of fun. It’s fun, really fun and I find myself enjoying this game more on a bad night than I do some of the other online shooters I play when I’m having a good night. There’s a lot of variety in terms of characters, levels and way of playing the maps depending on which character you are using. When rounds are over everyone is treated to an epically scored highlight reel of the play of the game and then given the ability to vote for players with stand out performances, often allowing the support characters, healers and real heroes to get the recognition and bonuses they deserve in a world where most games reward selfish play and lone-wolf hotshots. The simple but beautiful art style also means that the game still looks good but runs great. Progression is rewarded with skins, voice lines, spray tags and in-game currency rather than making your characters better and there is lot to celebrate in the fact that this game will be seeing completely free DLC going forwards in terms of maps and characters and is only relying on cosmetic mods and loot box purchases to make its extra money, although some major future paid expansions would be understandable. Verdict: Overwatch is a great amount of accessible fun that offers a good time in so many ways. We are having a blast with it and plan on playing it for a very, very long time to come!